C-lectin family 14 Member A (Clec14a) is a transmembrane protein specifically expressed in vascular endothelial cells during embryogenesis. Previous in vitro and in vivo studies have provided conflicting data regarding Clec14a role in promoting or inhibiting angiogenesis, therefore its functional role in vascular development remains poorly understood. Here we have generated a novel clec14a mutant allele in zebrafish embryos using TALEN genome editing. clec14a mutant embryos exhibit partial defects and delay in the sprouting of intersegmental vessels. These defects in angiogenesis are greatly increased upon the knockdown of a structurally related C1qr protein. Furthermore, a partial knockdown of an ETS transcription factor Etv2 results in a synergistic effect with the clec14a mutation and inhibits expression of early vascular markers in endothelial progenitor cells, arguing that clec14a is involved in promoting vasculogenesis. In addition, Clec14a genetically interacts with Vegfa signaling. A partial knockdown of Vegfaa function in the clec14a mutant background resulted in a synergistic inhibition of intersegmental vessel sprouting. 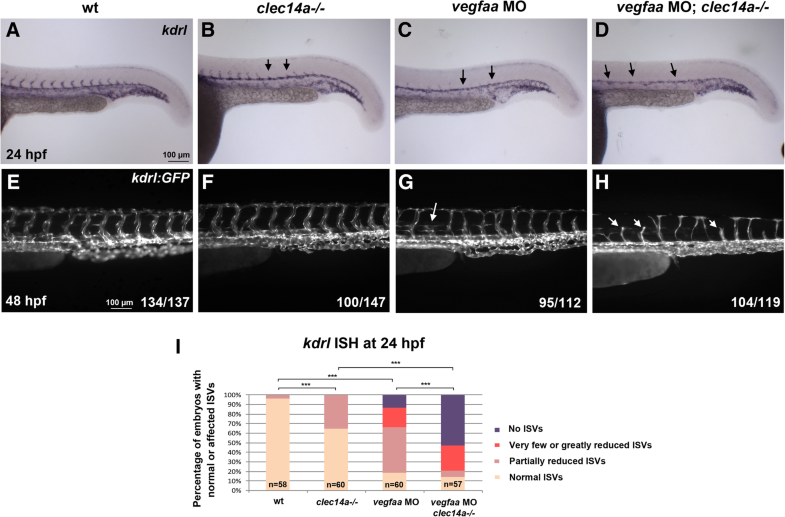 These results argue that clec14a is involved in both vasculogenesis and angiogenesis, and suggest that Clec14a genetically interacts with Etv2 and Vegf signaling during vascular development in zebrafish embryos. The online version of this article ( https://doi.org/10.1186/s12861-019-0188-6) contains supplementary material, which is available to authorized users. New blood vessels form by two distinct mechanisms, vasculogenesis and angiogenesis. Vasculogenesis involves formation of new blood vessels through differentiation of vascular endothelial cells de novo, while angiogenesis involves growth of new vasculature through sprouting from the existing blood vessels . Despite a significant progress in identifying signaling pathways that regulate vascular development, the molecular mechanisms that regulate vasculogenesis and angiogenesis are still only partially understood. C-type lectin family 14 member A (Clec14a, also known as C1qrl, Crl) is a transmembrane protein which contains a C-type lectin and EGF-like domains . Its protein sequence is highly conserved between multiple vertebrates including zebrafish, mouse and humans. We have previously described its expression in vascular endothelial cells in zebrafish embryos . Expression of clec14a was greatly downregulated in cloche / npas4l mutants, deficient in hematopoietic and vascular development. Similar to zebrafish, Clec14a is specifically expressed in vascular endothelial cells in mouse embryos and human tissues, and its expression is greatly upregulated during tumor angiogenesis [2, 4]. In vitro studies have demonstrated that CLEC14A promotes filopodia formation, cell migration and tubulogenesis [2, 4]. In zebrafish, it has been reported that Clec14a functions redundantly with a related protein C1qr / Cd93 in promoting angiogenesis . Double clec14a and c1qr mutant embryos showed greatly inhibited angiogenesis and reduced cadherin 5 (cdh5) expression, which could be rescued by synthetic cdh5 mRNA injection . In contrast, mouse Clec14a mutants displayed increased angiogenesis and lymphangiogenesis, accompanied by an increase in hemorrhages and vessel dilations . Clec14a deficiency resulted in reduced endothelial expression of Vascular Endothelial Growth Factor Receptor 3 (Vegfr3), while expression of Vegfr2 was increased. In addition, Clec14a was shown to physically interact with Vegfr3 . While all previous studies point to the role of Clec14a in regulating angiogenesis, it is currently unclear why the Clec14a knockout in mouse embryos results in increased angiogenesis, while the zebrafish clec14a mutants show reduced angiogenesis, similar to the CLEC14A knockdown in cell culture. Furthermore, it is currently unknown if Clec14a plays any role in vasculogenesis, in addition to its previously reported role in angiogenesis. 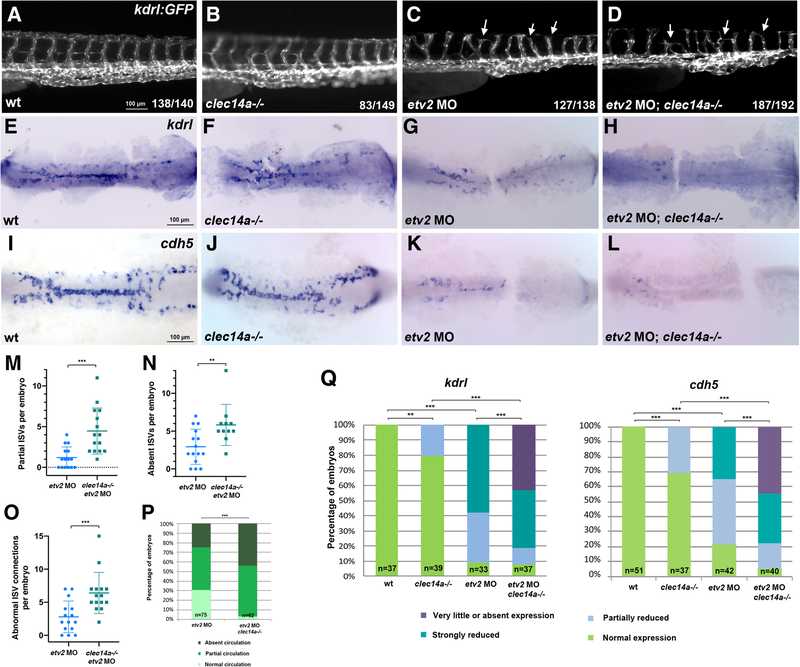 To address these questions, we generated a novel zebrafish clec14a mutant allele using transcription activator-like effector nucleases (TALEN)- mediated genome editing. Our results show that clec14a mutants display subtle defects in angiogenic sprouting which are greatly increased upon functional inhibition of a related C1qr protein. We demonstrate that clec14a genetically interacts with ETS transcription factor etv2 during vasculogenesis, demonstrating its novel role in promoting differentiation of vascular endothelial progenitors. We also show a synergistic genetic interaction between clec14a and Vegf signaling. 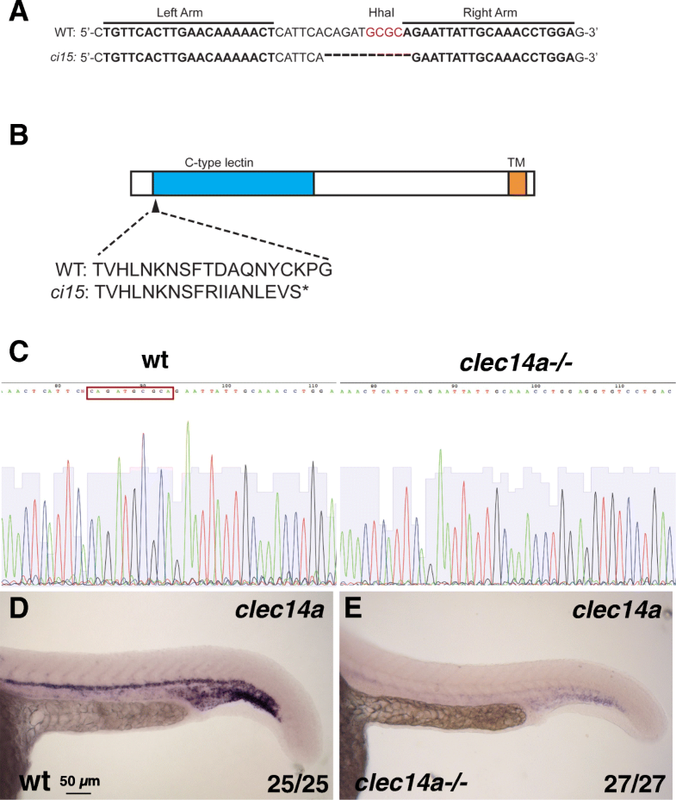 To analyze the function of zebrafish clec14a during vascular development, we generated clec14a mutant allele using TALEN genome editing . The clec14aci15 mutant allele carries a 10 bp deletion and is predicted to result in a frameshift and premature stop codon early in the open reading frame at amino acid position 44 (Fig. 1a, b). DNA sequencing of clec14a coding sequence amplified by PCR from cDNA obtained from clec14a mutant embryos at 24 hpf confirmed the presence of expected 10 bp deletion (Fig. 1c, d). No other splice variants or additional PCR bands were identified in clec14a cDNA of clec14a mutant embryos (data not shown). Expression of clec14a was greatly reduced in clec14a homozygous mutant embryos as analyzed by in situ hybridization (ISH) (Fig. 1c, d). These data argue that the level of clec14a mRNA is greatly reduced in clec14a mutants, and the remaining transcript does not code for a functional protein, suggesting that the mutation allele is null or close to null. Nevertheless, homozygous clec14a mutant embryos were morphologically normal, did not show any obvious defects and were viable as adults (data not shown). A previous study suggested that Clec14a functions redundantly with a related protein C1qr . Recent studies have shown that expression of functional homologs is often upregulated in genetic mutants as a part of a compensatory mechanism . Indeed, c1qr expression was increased by 2.9-fold (±0.7 SEM) in clec14a−/− mutant embryos at 24 hpf by qPCR analysis compared to wild-type embryos (p = 0.03, Student’s t-test). To test if c1qr compensates for the loss of clec14a function, we designed and injected a translation-blocking morpholino (MO) against C1qr protein in either wild-type or clec14a−/− embryos crossed into vascular endothelial specific kdrl: GFP transgenic background. Phenotypic analysis revealed that about 20% of clec14a−/− mutants and 12.5% of c1qr MO injected embryos showed reduced or delayed intersegmental vessel (ISV) sprouting at 28 hpf. This percentage was slightly higher (26.5%) in double knockdown c1qr MO; clec14a−/− embryos, which was not a statistically significant difference (Fig. 2a-d, m). 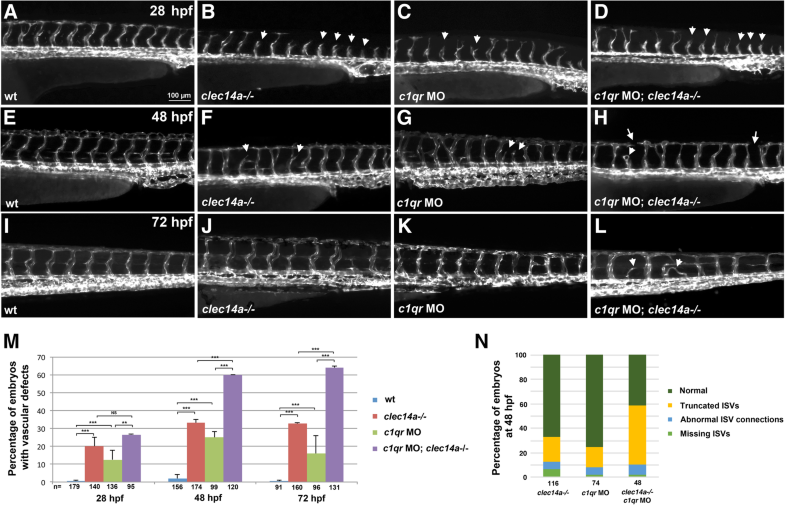 Sprouting defects including truncated or missing ISVs and abnormal ISV connections persisted in a significant fraction (16–33%) of clec14a−/− or c1qr MO injected embryos at 48 and 72 hpf (Fig. 2e-n). In contrast, the majority of double knockdown c1qr MO; clec14a−/− embryos (60–64%) displayed abnormal ISV connections, mispatterned ISVs, partial ISV sprouts and defects in the formation of the dorsal longitudinal anastomotic vessel (DLAV) (Fig. 2h, l-n). Overall, the ISV sprouting defects observed in c1qr MO; clec14a−/− embryos were similar to the previously reported defects in c1qr; clec14a double mutants , arguing that the MO specifically inhibits C1qr function. To confirm that c1qr MO effectively inhibits protein expression, we designed a GFP reporter by fusing 939 bp of c1qr genomic sequence immediately upstream of the translation-initiating ATG codon to the GFP reporter and SV40 polyA sequence. 11% of embryos injected with this construct showed GFP expression in multiple cells in the trunk and tail region while none of the embryos co-injected with the GFP reporter and c1qr MO showed such expression (Additional file 1: Figure S1). This argues that c1qr MO can effectively inhibit GFP reporter expression. Injection of a control MO or a 5-base mismatch MO into clec14a mutants did not affect the percentage of embryos with ISV defects, further arguing for the specificity of the observed phenotype (Additional file 1: Figures S2 and S3). Thus, C1qr and Clec14a function partially redundantly during angiogenic sprouting. We then analyzed expression of vascular markers in clec14a−/− mutants, c1qr MO-injected embryos and double clec14a−/−; c1qr MO embryos using in situ hybridization (ISH). The majority of clec14a−/− or c1qr MO embryos displayed normal expression of Vegfr2 homolog kdrl, ETS transcription factor fli1a and VE-cadherin / cdh5, while a fraction of these embryos (13–34%) exhibited inhibition of ISV sprouting (Fig. 3a-c, e-g, i-k, u, and data not shown). The percentage of affected embryos correlated closely to the percentage of embryos showing ISV defects based on kdrl: GFP fluorescence analysis. In contrast, double c1qrMO; clec14a−/− embryos showed strong reduction in ISV sprouting (Fig. 3d, h, l, u). Expression of the arterial marker cldn5b in the dorsal aorta (DA) and venous marker flt4 in the posterior cardinal vein (PCV) was not significantly affected in clec14a−/−, c1qrMO or double knockdown embryos, suggesting that arteriovenous patterning was not affected while ISV sprouting was partially inhibited, similar to the results obtained with the other markers (Fig. 3m-u). To test if clec14a may participate in early vasculogenesis, we analyzed its genetic interaction with the ETS transcription factor Etv2 / Etsrp, a key regulator of early vasculogenesis [9, 10]. Injection of low doses of 0.125 or 0.25 ng per embryo of the previously validated etv2 morpholino  resulted in partial defects in vasculogenesis and angiogenic sprouting. ISV sprouting defects at 48 hpf were more severe in clec14a−/−; kdrl: GFP embryos injected with 0.25 ng of etv2 MO compared to wild-type kdrl: GFP embryos injected with the same dose of etv2 MO (Fig. 4a-d). The number of partial ISVs, absent ISVs and abnormal ISV connections per embryo was significantly increased in clec14a−/−; etv2 MO embryos compared with wild-type embryos injected with etv2 MO (Fig. 4m-o; because the majority of clec14a−/− embryos do not show ISV defects, they were not included in this analysis). While 31% of wild-type etv2 MO injected embryos had normal axial blood circulation at 48 hpf, only 3% of clec14a−/−; etv2 MO embryos had normal circulation, while the rest showed partially or completely inhibited axial circulation (Fig. 4p, Additional file 2: Movie S1 and Additional file 3: Movie S2). To test if clec14a−/− contributed to early vasculogenesis, we analyzed kdrl and cdh5 expression in vascular endothelial progenitors at the 15–16-somite stages. There was no apparent difference between the majority of clec14a−/− embryos and wild-type controls while a fraction of clec14a mutant embryos showed a slight reduction in kdrl and cdh5 expression (Fig. 4e, f, i, j, q). Wild-type embryos injected with a low 0.125 ng dose of etv2 MO showed significant inhibition in kdrl and cdh5 expression (Fig. 4g, k, q). Injection of the same dose of etv2 MO into clec14a−/− embryos resulted in a much stronger inhibition in expression of these markers. In most embryos, very few cells with weak kdrl and cdh5 expression were present (Fig. 4h, l, q). Because the phenotype of this severity was observed only in the double etv2 MO; clec14a−/− embryos, this indicates a synergistic effect between etv2 MO knockdown and clec14a mutation. These results suggest that clec14a contributes to vasculogenesis and functions during the specification and differentiation of vascular endothelial progenitors. We then tested genetic interaction between clec14a and Vegf signaling. As analyzed by kdrl expression at 24 hpf, low dose injection of the previously validated vegfaa MO  resulted in a partial reduction of ISV sprouting while axial vessel development appeared unaffected (Fig. 5c). Injection of vegfaa MO in clec14a−/− mutants resulted in a much stronger effect. The majority of embryos had no ISV sprouting at 24 hpf (Fig. 5a-d, i). More severe inhibition of ISV sprouting and DLAV formation was also apparent at 48 hpf based on kdrl: GFP expression in vegfaa MO; clec14a−/− embryos compared to single clec14a mutants and vegfaa MO embryos (Fig. 5e-h). Thus, inhibition of Clec14a and Vegfaa function results in a synergistic interaction. Our results argue that clec14a participates in both vasculogenesis and angiogenesis in the zebrafish model system. clec14a mutant embryos display mild defects in angiogenesis. The defects are significantly more severe upon simultaneous depletion of c1qr, suggesting functional redundancy between the two genes. It was previously demonstrated that genetic mutants frequently exhibit upregulation of functionally homologous genes resulting in functional compensation . Our results show that c1qr expression is upregulated in clec14a mutants. It is likely that c1qr can partially compensate for the absence of clec14a function, and therefore strong vascular defects are observed only when both homologs are inhibited. Similar redundant function between clec14a and c1qr in zebrafish embryos has been previously reported . Differently from the previous study, we did not observe reduced survival among clec14a mutants. While the nature of clec14aci15 allele is different from the previously described c1qrl / clec14a cq30 allele , clec14aci15 mutants show great reduction in clec14a mRNA expression likely due to the nonsense-mediated RNA decay, and therefore it is likely to be a null or close to null allele. It is not clear why mouse and zebrafish clec14a mutants show quite different phenotypes. It is worth noting that previous studies have reported reduced angiogenesis upon Clec14a knockdown in vitro [2, 4], which is similar to the zebrafish clec14a mutant phenotype. Increased angiogenesis in mice was observed at much later stages (E13.5)  than the phenotypic analysis in ISV sprouting that we performed in zebrafish. It is possible that distinct vascular beds are affected differently by the loss of Clec14a function. The defects in ISV sprouting are quite mild, and are only pronounced upon combinatorial knockdown of clec14a and other genes involved in ISV sprouting. It is possible that Clec14a in mouse may also have an earlier role in promoting angiogenesis which is not apparent due to functional redundancy with C1qr or other related proteins. 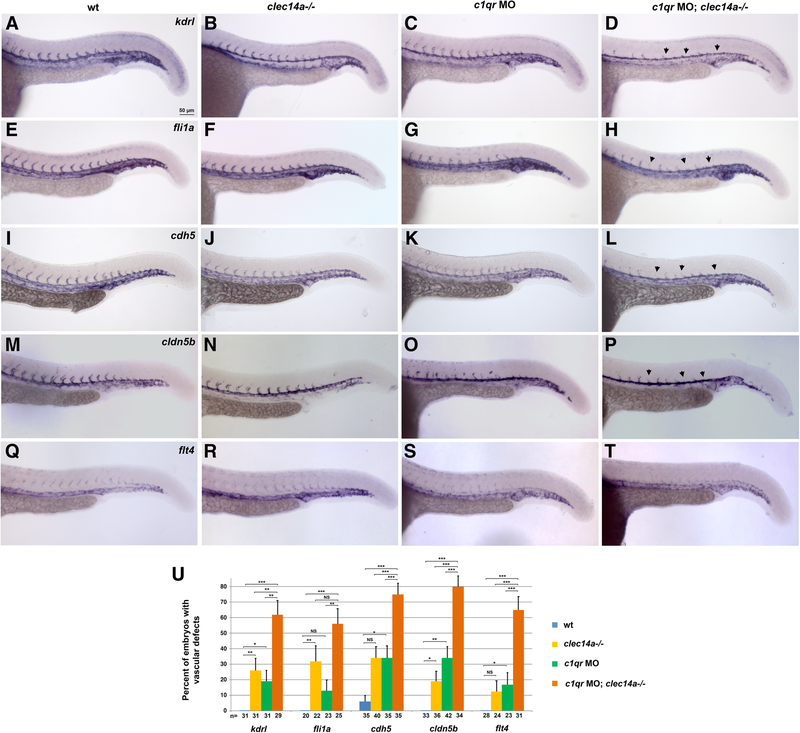 Zebrafish clec14a expression was greatly downregulated or absent in cloche/npas4l or etv2 mutants prior to 24 hpf [3, 9], while etv2 expression was not affected in clec14a/c1qrlcq30 mutants , suggesting that clec14a functions downstream of npas4l and etv2. Intriguingly, clec14a mutants showed synergistic interaction with etv2 during vasculogenesis. The combinatorial loss of clec14a and partial knockdown of etv2 function resulted in a much greater reduction in vascular kdrl and cdh5 expression than separate mutation or knockdown of clec14a and etv2. Synergistic interaction observed under partial etv2 knockdown suggests that either clec14a functions downstream of etv2 in the same pathway, or both clec14a and etv2 function in two parallel and converging pathways during vasculogenesis. Yet despite the major defects in vasculogenesis at mid-somitogenesis stages, the same clec14a−/−; etv2 MO knockdown embryos displayed relatively mild ISV sprouting defects at later stages. This partial recovery of vascular defects is likely due to the compensation of Etv2 deficiency by other ETS transcription factors such as Fli1b; we have previously demonstrated that Fli1b plays a major role in the partial recovery of defects in vasculogenesis observed in etv2 mutant embryos . Vegf signaling plays multiple roles during vasculogenesis and angiogenesis . It has been recently shown that Clec14a physically interacts with Vegfr3 in vitro, and that mouse Clec14a knockout embryos show reduced Vegfr3 expression and increased expression in Vegfr2 which correlates with increased angiogenesis . However, no increased angiogenesis was observed in zebrafish clec14a mutants. flt4/vegfr3 and kdrl expression in the axial vasculature was not significantly affected in clec14a−/−; c1qr MO embryos, while ISV sprouting was reduced. It is possible that inhibition of angiogenesis may be a consequence of reduced Vegf signaling in clec14a mutants. Because Vegf signaling potentiates etv2 expression during vasculogenesis , this would also explain synergistic interaction between the etv2 and clec14a knockdown / mutation during vasculogenesis. However, synergistic interaction between clec14a mutation and vegfaa MO knockdown does not exclude a possibility that clec14a may also function in a separate parallel signaling pathway which promotes angiogenesis. Multiple other pathways including Angiopoietin-Tie2 and Delta-Notch signaling have been implicated in angiogenesis . Further research will be required to test a potential clec14a involvement in these pathways. This study demonstrates the requirement for clec14a in both vasculogenesis and angiogenesis in the zebrafish model system. clec14a functions partially redundantly with a related protein C1qr / Cd93 during sprouting angiogenesis. In addition, clec14a genetically interacts with the ETS transcription factor etv2 during vasculogenesis, demonstrating its novel role in promoting differentiation of vascular endothelial progenitors. Furthermore, our results show synergistic genetic interaction between clec14a and Vegf signaling. These results will promote our understanding of the mechanisms that guide vascular development. clec14a ci15 line was obtained by TALEN mutagenesis. TALENs were designed to the single clec14a exon using the TAL Effector Nucleotide Targeter software at https://tale-nt.cac.cornell.edu . The target site TGTTCACTTGAACAAAAACTcattcacagatgcgcAGAATTATTGCAAACCTGGA was chosen near the 5′ end of the exon. The spacer sequence indicated in lowercase contains the HhaI enzyme recognition site CGCG. TALEN constructs were generated using Golden Gate assembly . mRNA for the left and right TALEN arms was synthesized using T3 mMessage mMachine Kit (ThermoFisher). 50 pg each mRNA of was injected into 1-cell stage embryos. The following PCR primers flanking the TALEN recognition site were used to test for TALEN efficiency in pools of injected embryos: clec14a_F 5′-GCAGACATGGATTTCTGGATGG-3′, clec14a_R 5′-AGTGCTGTTGTCCACCGTC-3′. These primers amplify a 315 bp product that was fully digested by HhaI to produce 116 bp and 199 bp products in uninjected embryos. 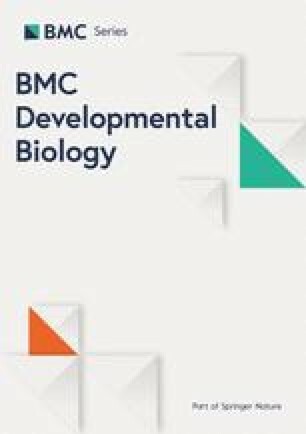 Retention of the 318 bp product in injected embryos indicated efficient TALEN mutagenesis. Adult carriers were identified by PCR genotyping using the same primers and HhaI enzyme digest. PCR products were sequenced using the clec14a_F primer to determine the deleted region. Homozygous clec14ci15 embryos in Tg (kdrl: GFP)s843  background and control Tg (kdrl: GFP) s843 embryos were obtained from incrosses of homozygous clec14ci15; kdrl: GFP and wild-type kdrl: GFP adults, respectively. Embryos were raised at 28.5 °C or 32 °C temperature. Embryonic staging was performed according to the established criteria . Live embryos were analyzed at 28–72 hpf stages for vascular defects based on kdrl: GFP expression. Embryos which contained any ISVs in the trunk and tail region which were either not fully extended, absent or formed abnormal connections were counted as embryos with vascular defects. A translation-blocking c1qr MO (GTCACTCTCATACTACTCGCTTTAG, Gene-Tools Inc), a 5-base c1qr mismatch MO (GTCAgTCTgATAgTACTCggTTTAG), a standard control MO (CCTCTTACCTCAGTTACAATTTATA, Gene-Tools Inc), a previously reported vegfaa MO (GTATCAAATAAACAACCAAGTTCAT)  and etv2 MO2 (CACTGAGTCCTTATTTCACTATATC)  were used for experiments. All injections were performed at 1–2-cell stage. Whole mount in situ hybridization was performed using DIG-UTP labeled probes synthesized with T3, T7, or SP6 polymerase (Promega) as previously described . Antisense RNA probes for the following genes were synthesized as previously described: kdrl / flk1 , fli1a , cdh5 , cldn5b , flt4 , clec14a / crl . RNA was purified from 15 to 20 wild-type and clec14a mutant embryos in kdrl: GFP background at 24 hpf using PureLink RNA purification kit (Thermo Fischer Scientific). cDNA was synthesized using SuperScript VILO cDNA synthesis kit (Thermo Fischer Scientific). PCR product corresponding to the coding sequence of clec14a was amplified with the following primers: TAAGCACTCGAGCACCATGGATTTCTGGATGGTATTACATC and TGCTTAAGATCTTTAGGTTTCCTCTTTTTCATTCACC. qPCR for c1qr expression was performing using the following primers: GCTTGACTCAGTTACCTGACGG and TTTCTGCTCGCTGTCCAACCC. Amplification was performed using the SYBR green PCR master mix and Step One Plus real-time PCR system (Thermo Fischer Scientific). Quantification was normalized to ef1a expression which was amplified using the following primers: TCACCCTGGGATGAAACAGC and ACTTGCAGGCCATGTGAGCAG. Two independent embryo replicates (15–20 embryos each) and 2–4 technical replicates for each sample were performed. 939 bp c1qr upstream fragment was amplified by PCR from the CH211-202F3 BAC construct (obtained from Children’s Hospital Oakland Research Institute) using Expand High Fidelity PCR System (Sigma-Aldrich) and the following primers: c1qr-F: TCCATTTGCCTTCGGCTGGG and c1qr-R: CGAGTAGTATGAGAGTGACGGG. GFP-polyA sequence was PCR amplified from XGM2 (Xenopus EF1a-GFP-polyA construct)  using GFP-forward primer with an attached sequence that overlaps with the c1qr promoter fragment, and SP6 24-mer primers: GCGAGTAGTATGAGAGTGACGGGATGAGTAAAGGAGAAGAACTTTTCACTGG and CATACGATTTAGGTGACACTATAG. The final product was amplified by PCR using c1qr-F and SP6 24-mer primers and the initial two PCR products as DNA templates. PCR product was gel-purified, diluted in 1x Danieau buffer (58 mM NaCl, 0.7 mM KCl, 0.4 mM MgSO4, 0.6 mM Ca (NO3)2, 5 mM HEPES, pH 7.6) and injected into the embryo blastomere at 1-cell stage at a dose of 50 pg per embryo. Embryos were whole-mounted in 2% methylcellulose on glass slides. Images were captured using a 10x / NA 0.3 objective on an AxioImager Z1 (Zeiss) compound microscope with an Axiocam ICC3 color camera or Axiocam MMR grayscale camera (Zeiss). Images in multiple focal plans were captured individually and combined using the Extended Focus module within the Axiovision software (Zeiss). For ISH images at mid-somitogenesis stages, embryos were deyolked and flat-mounted in the araldite medium (EM Sciences). We thank Sarah A. Mowery for her assistance with experiments during manuscript revision. This research was supported by the National Institutes of Health award R01 HL107369 to S.S. and Cincinnati Children’s Research Foundation Trustee Award to J.A.S. The funding bodies had no role in the design of the study and collection, analysis, and interpretation of data or in writing the manuscript. All data generated or analysed during this study are available from the corresponding author on reasonable request. KP performed the experiments and analyzed the data, JAS generated clec14a mutant line, and edited the manuscript, SS designed and supervised the study, contributed to the analysis of the results, and wrote the manuscript. All authors read and approved the final manuscript. No human subjects were used in the study. Zebrafish embryo experiments were performed under animal protocol IACUC2016–0039, approved by the Instutional Animal Care and Use Committee at the Cincinnati Children’s Hospital Medical Center.